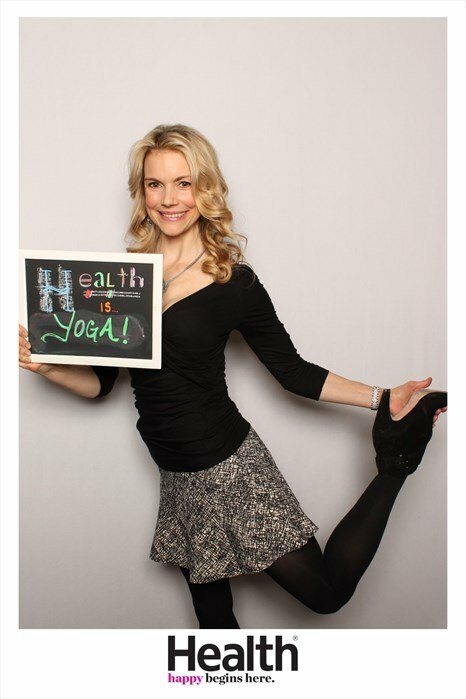 I recently attended a Health event as the magazine launched its new mantra, “Happy begins here.” I love that saying. I have been really trying to remind myself daily that happiness comes from within me. All I have to do is see my little guy’s smile to be really happy; but there are some days I admit I can feel blue. I spoke at the event about anxiety and depression. Anxiety usually stems from worrying too much about the future and your “to do” list. Here are some yoga poses you can do to combat anxiety. Depression, on the other hand is when we get stuck in the past. Practicing yoga helps ground ourselves in the present moment so we can feel truly happy. Try rocking forward to the front of your feet or sit bones (if you’re seated) and notice how it produces anxiety, moving in to the future too fast. Now, lean back in your seat or to the heels of your feet; notice how you slump your shoulders forward and feel a little down. Finally, feel yourself anchored right in the middle of your seat or your feet and feel grounded and present. Try this exercise whenever you find yourself a little too anxious or a bit depressed. After I shared this information in my past newsletter I heard from some friends and students that they too suffer from both anxiety and depression. I honestly can’t believe that I’ve had some down days lately. I have such an amazing little boy and an incredible family and I love my career. Yet, for some reason I was weepy and sad and wanted to cry at the drop of a hat a few weeks ago and felt I couldn’t control it. I am admitting this because I want everyone to know that we are all human and we all have emotions. Depression is a real thing and it’s difficult to be in the depth of it and feel somewhat helpless. Yoga has always been a life saver for me and has lifted my spirits on many occasions. The other day I finally made it to one of my favorite teacher’s class and I felt beautiful and strong as I flowed through the postures. Everyone’s case of depression or anxiety stems from different sources and it’s ideal to be able to find someone to talk to when things get really overwhelming. I do believe that moving the body and connecting the breath and mind and spirit is extremely beneficial as well. Here are some of my favorite poses for combatting depression. Because depression stems from harboring past emotions or feeling stuck with unresolved anger, it’s important to focus on future moving postures and heart opening. If you look at a depressed person, their shoulders are rounded forward and their heads hang down. Backbends open our chest, force us to lift our heart center and raise our heads high. It’s like the expression “fake it till you make it”. Often times, we just have to physically change our bodies, and our spirits and minds will follow. Even just making yourself smile (it will feel unnatural at first) can help us shift our outlook and attitude. Exercise is the best natural medicine I know of. Take a walk in nature, go for a jog, hit the slopes or the tennis courts and practice yoga. I promise you it can make a huge difference. Camel–This is an awesome posture for lifting the chest and opening the shoulders. Start on your knees and place your hands on your lower back. Squeeze your shoulder blades together and raise your chest up to the ceiling. Stay here or reach back for you heels. Hold and breathe 5 breaths. Come up and repeat one more time. Dancer’s Pose–It’s almost impossible to do this pose and not feel some sort of joy! Start standing and bend your right knee back as you grab hold of the top of your right foot. Extend your left arm forward and join the thumb and forefinger to touch. Lengthen your right leg back behind you as you backbend your chest towards the ceiling and look up to your left hand. Hold 5 breaths then repeat on the opposite side. Incline Plank—I love this posture for really opening up the shoulders and elevating my mood. Start seated with your legs out in front of you, place your hands about 10 inches behind your hips with fingers facing forward. Press in to your hands and feet and lift your entire body off the floor. Hold for 5 breaths then lower down and notice the opening in your heart center.